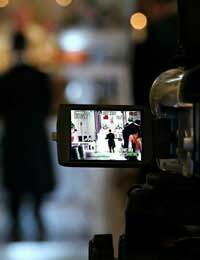 There are many different tips and techniques you can adopt to light your home video recording effectively, but at a basic level when you are filming indoors, you need to become familiarised with what is known in the industry as the ‘three-point lighting’ technique. Back Light – This is used to create a sense of visual separation between the subject and the background. By placing this light behind and to the side of the subject but out of view of the camera, it has the effect of illuminating the edges of the subject in order to give the shot some depth. It’s important to remember how crucial shadows are to the whole context of lighting when shooting a scene. To the uninitiated, shadows might be considered interference but they play a part in ensuring that there is some depth to the subject of your video. A prime example of this is when you film the face of your subject. If their nose wasn’t to cast a shadow on their face, the result would look pretty weird on camera. Once you get used to lighting techniques, you’ll begin to be able to distinguish between ‘good’ and ‘bad’ shadows. Good shadows are not entirely dark and they have softer edges. You can help to create that impression through diffusing light which you can achieve by bouncing it off a wall and this helps to soften the dark areas and to even out the light overall. You should also check that the light is even if you stop to cut to a different angle for your next shot. Therefore, you’ll need to experiment and move the positions of your lighting equipment around and keep checking your monitor or viewfinder to ensure that there’s no visible ‘clashing’ with the lighting as you switch to filming from different angles. With some creative ingenuity and experimentation, you can achieve successful results using the three-point lighting technique, without the need for lots of expensive equipment. For example, a floor lamp, a desk lamp and a piece of white poster board (which can be substituted for a fill light) can work just as well as a professional lighting rig if you experiment long enough. In essence, your video can be ruined if you haven’t paid enough attention to your lighting. There are, of course, technical gizmos available which will work out if all of your lighting and angles are right at the touch of a button but your eyes alone are also a good enough guide. Basically, the questions you need to ask yourself include whether the subject’s face is evenly lit or if there are dark shadows affecting it, if the subject’s face seems bleached or washed out, then the chances are you have over lit them and if their face seems grey or flat, then they have probably been under lit. Another golden rule is to ensure that any light situated behind the subject is much weaker than the light shining directly onto them – this latter issue being probably the biggest mistake amateurs tend to make. What Makes a Good Video Diary?